The city of San Francisco on the west coast of America is a absolute mecca for the aficionado of buses, trolleybuses, trams and cable cars! All are controlled by the ‘San Francisco Municipal Railway’, known as the ‘Muni’ which is also responsible for the Cable Cars, Historic Trams, Buses and the Metro (Light Rail System). The independent transport videos cameras made a visit to this vibrant city in the early part of 2007 to capture the delights of these vehicles on video. 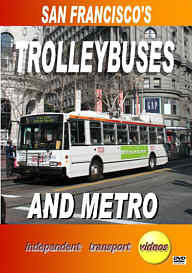 This programme concentrates on the trolleybuses and Metro. The smart modern fleet of trolleybuses consists of over 400 rigid 40 feet long vehicles, as well as numerous articulated examples. The main livery is all over white with a red, fading to orange strip along the roof line. Others carry either a mainly white base with a large orange/red band, whilst the remainder are silver with a red band. All are immaculately turned out and emphasise the fact that they are “Zero Emission Vehicles”. Our filming starts on Steuart Street, near the Ferry Terminal building and we then make our way along San Francisco’s main thoroughfare – Market Street where we capture almost continues action. We venture into the suburbs with some scenes shot at Laurel Heights, and then back to busy Columbus Avenue where the trolleybuses share the road with the cable cars. We return to Market Street for some exciting night time filming to capture these vehicles at work alongside the superbly turned out PCC tramcars, which is the subject of another itv production. There are further scenes of trolleybuses in action across the city, their power emphasised as they climb effortlessly up the many hills of this fascinating US city. We then turn our cameras to the ‘Metro’, a smart and efficient Light Rail System. Starting at Ocean Beach we see the vehicles turning at this the western end of the ‘N’ route. Action is captured at Church Street where there is a busy interchange and see the vehicles in traffic with the Historic trams and trolleybuses. Finally we film Folsom Station where the vehicles emerge from an underground section, the other end of route ‘N’. So take your seat and be impressed by these smart electric vehicles! Duration : 56 minutes (approx).